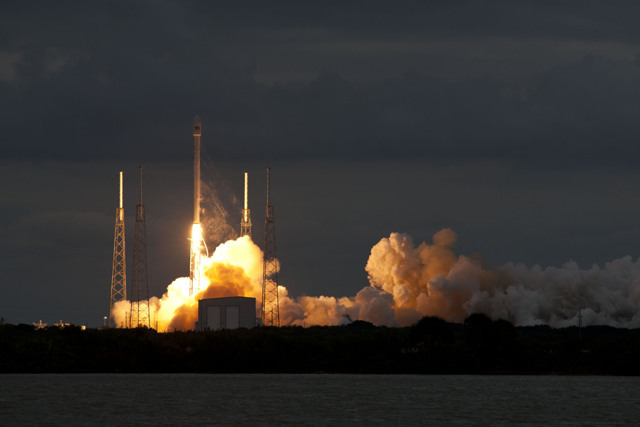 After the various trials of the ultimately successful SES-8 mission on December 3rd, SpaceX’s New Year’s resolutions almost certainly included a trouble free flight for its second GTO launch in 34 days, and the first of a busy 2014. And that is exactly what they got. This evening’s liftoff took place on time at the beginning of its launch window, occurring at 5:06 p.m. EST. After initially delivering the payload to a parking orbit of 497 x 173 km at an inclination of 27.7 degrees to the equator, the second stage re-ignited for a brief burn to place the place the Thaicom-6 satellite into geostationary transfer orbit, confirming successful release at 5:37 p.m.
With tonight’s launch, SpaceX has taken another step in validating its commercial credentials, demonstrating the company’s ability to meet a fast paced launch schedule. Also, having now conducted two launches from the same pad over a 34 day time frame, SpaceX has shattered the best turnaround recorded by either of Atlas V or Delta IV ULA boosters, against which it is competing to enter the USAF’s EELV program. In a related note, SpaceX has now completed three successful missions of the Falcon 9 V1.1, presumably qualifying it for EELV consideration after the Air Force finishes necessary reviews outlined under the CRADA agreement governing the entry process. Finally, in a manner of speaking, SpaceX has now launched the equivalent of the three core Falcon Heavy first stage, moving it ever so much closer to a long anticipated first flight. The next flight however, is NASA’s CRS-3 resupply mission to the International Space Station, scheduled for February 22nd, in which it will need to repeat the split second launch timing demonstrated today. Meanwhile Orbital Sciences Corporation’s next launch to ISS, which had been scheduled for January 7th, has been pushed back to the 8th or more likely the 9th due to the extreme cold at its Virginia launch site.